to look at, but boy are they healthy! Good habits are hard to come by. So, it's logical that today's Think Kit prompt challenges us to discuss a habit formed this year that we want to maintain. Like my back, my diet is an aspect of my health that has made me feel like somewhat of a failure. Don't get me wrong, I've done a decent job about regulating my fast and junk food habits. I've worked diet soda down to minimal consumption levels. Plus, I'm about a 65% vegetarian. Another adjustment I've made to my diet is reducing my bread intake. Overall I think I'm doing well, given that I'm a few pounds over weight and that I don't exercise that much. However there is one aspect of my diet that bothers me. The one thing I struggle with is my recommended daily intake of fruits and vegetables. You can look it up, but I read somewhere that only around 30 percent of adults eat their recommended dose of vegis and fruits. How is it that three to five servings a day of fruits and vegetables could be so difficult? I'm not a picky eater in any way, shape or form. I've grown to consider a salad an acceptable main dish at either lunch or dinner. Nonetheless, when I started tracking my actual consumption I was a little dismayed. So, I made a conscious effort this year to make the home made smoothie a habitual daily routine. I take these whole fruits and vegis and toss them into a blender. By themselves, they make for a thick nutritive mix. So, I add some ice and water, and you've got a greenish-brownish glass of nutritious yum. 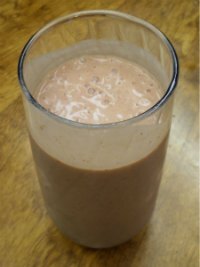 The family and I toast glasses of homemade smoothies most mornings and are a couple of servings closer to that seemingly less elusive nutritional goal. I plan to continue this habit into 2014 and beyond. I would love to hear if you've got a preferred recipe that I could incorporate.